Jalapeño Hot Peppers-4 Do not take our Jalapeño peppers lightly. They are quite hot. Sweet Corn-4 ears This is the first year we have grown Sweet Corn. There may be a worm in the tip of the ear. If so, shake it out and break off the tip. It is organic and this is one of the challenges. Blueberries-no spray. Last week for the blueberries. Unfortunately today’s tomatoes missed their ride on the truck into the city, so while we won’t be able to indulge in them this week, we can look forward to a double allotment of tomatoes next week! 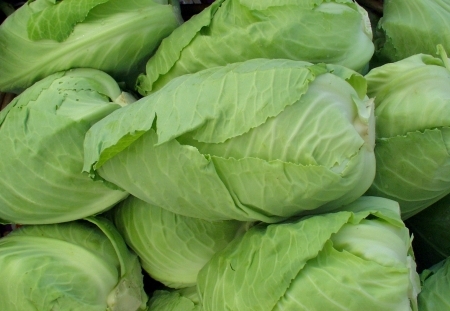 For me, one of the most difficult CSA vegetables to use is cabbage. Every week, the head of cabbage inevitably outlasts the rest of the share, lingering sadly at the bottom of the vegetable drawer. This year I was determined to make a change, and this salad is helping me on my way. It’s adapted from here, updated to include more of what we’ve been getting lately. This would also be delicious with grilled chicken bites instead of tofu. Rinse and drain tofu. Cut tofu into 1/2-inch thick slices and place between clean kitchen towels (or paper towels) to press out excess liquid. Let sit 15 minutes. Meanwhile, make the dressing: In a bowl, whisk together the mandarin orange zest, mandarin orange juice, rice vinegar, sesame oil, hot chili oil or hot peppers, soy sauce, sugar, ginger, and garlic. Toss cabbage and all veggies with the dressing and sprinkle almonds and sesame seeds on top. If you’re not serving right away, store the dressing in the fridge and dress about an hour before eating. First share of July and first fruit share delivery!